There once was a time when Disney ruled the market for animated and family films. Their classic fairytales and musicals were second to none, even scoring a historic Best Picture nomination for Beauty and the Beast in 1991. But after the disastrous Hercules sounded the death knell for the glory days of Disney, it was all downhill from there, with the studio getting by on direct-to-video sequels and substandard CG kiddie movies, with their only solid works coming from the films of Pixar. But after all that, all it took for redemption was for Disney to poke fun at itself, which is what makes its latest animated/live action venture Enchanted such an utter delight. The film starts out in old fashioned, hand-drawn animation just like the Disney classics of old…and it looks and feels just like every one of them you’ve ever seen. We are introduced to Giselle (a luminous Amy Adams), a young woman who lives out in the forest with only her animal friends to keep her company, who dreams of one day falling in love with a handsome prince. Which happens, of course, when one rides into the forest to rescue her from an ogre. 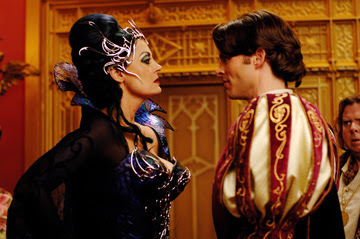 But the prince’s (James Marsden) evil mother, Queen Narissa (Susan Sarandon…clearly having the time of her life) fears for her throne, and banishes Giselle to the real world, where “there are no happy endings.” That’s when the film becomes live action and Giselle’s trouble really begins, adjusting from her incessantly optimistic and happy Disney kingdom of Andalasia to cynical modern day New York City. It’s refreshing to see a studio mock its own formula so slyly and gamely, but it is done out of real affection for the Disney cartoons of old, with references to Snow White and the Seven Dwarfs, Sleeping Beauty, Cinderella, Lady and the Tramp, Beauty and the Beast, and The Little Mermaid, and probably some more that I missed. The animated sequences (purposefully cheesy as they are) reminded me of just how great Disney was at this, and still could be if it wanted to, as evidenced by Enchanted. The entire cast commits to the premise earnestly and enthusiastically, especially Amy Adams who is an absolute vision. Their commitment keeps the film from becoming mean spirited - this is a loving send-up of a venerable institution, films we all grew up with. Disney also made the right choice by bringing back composer Alan Menken, who composed music for most of the studio’s ever-popular run of musicals from the late 80s - 90s such as Little Mermaid, Beauty and the Beast, Aladdin, Pocahontas, and The Hunchback of Notre Dame - as well as lyricist Stephen Schwartz, who collaborated with Menken on several Disney musicals after the death of Menken’s previous collaborator, Howard Ashman. The music recaptures the perkiness of classic Disney show tunes. To be honest, I haven’t seen a non-Pixar family film this joyous, this exuberant, and this thoroughly creative in a long time. Most of the film’s shortcomings seem almost nitpicky in retrospect (the talking dragon is too, well…pretty, and not nearly as menacing as Sleeping Beauty’s Maleficent, who inspired it). Enchanted is a clever throwback to a bygone era that is very much a product of this one; a clash of past and present combining for something truly magical - a quality that has been sorely lacking from Disney’s recent output. It is, in a word, enchanting. i definitely agree... i went to see Enchanted with low expectations and was pleasantly surprised. i like your tidbit about the composer, i didn't know that. overall, especially because of the music, this film was pretty damn enjoyable.